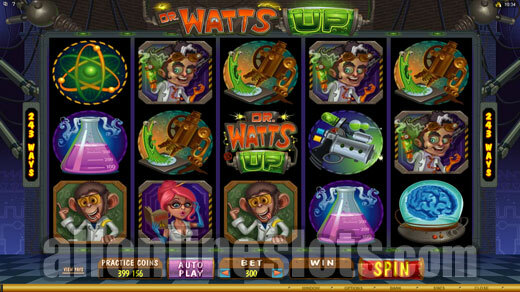 Dr Watts Up is a 243 ways Microgaming video slot with a mad professor theme. 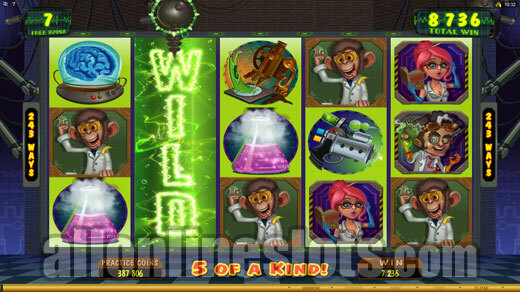 The game has two bonus features with a Laboratory Bonus and a free spins bonus where you always get one reel turned wild for each free game. 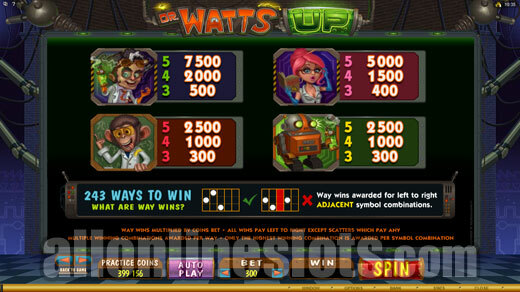 Dr Watts Up is a Microgaming video slot that uses the 243 ways format. 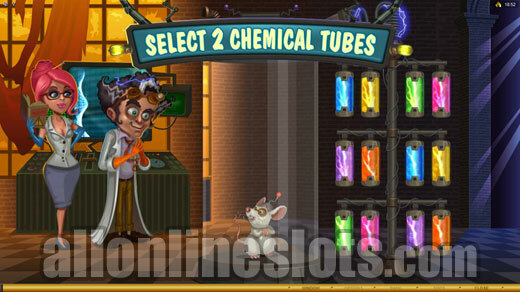 The game has a mad professor theme and offers two different bonus features. Minimum bet for all ways is 30 coins and you can choose to bet up to 20 coins per way for a total max bet of 600 coins. 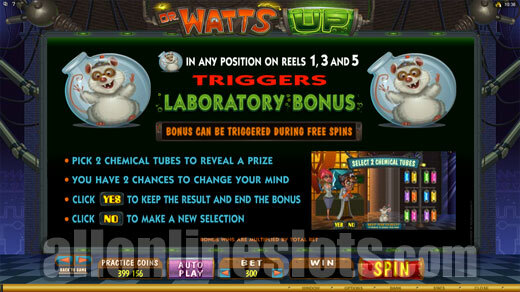 The Dr Watts Up logos are wild and substitute for all symbols except the scattered Atom symbols and the Bonus Mice. 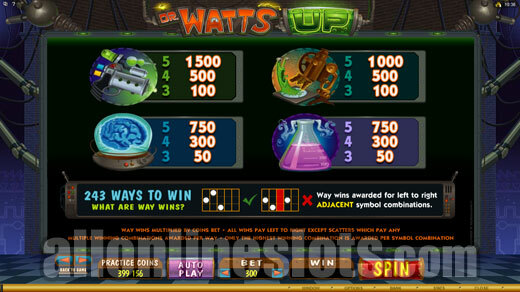 Getting five wilds anywhere on the screen awards the top way win of 2,500 coins or 50,000 coins if you're betting max. After the top win for the wilds the next highest way wins are 750 coins for five of the Doctor symbols, 500 coins for five of the Assistant symbols and 250 coins for either five Monkey or Robot symbols. All of these wins are at one coin so if you're playing max bet you can multiply them by 20. Dr Watts Up has two bonus features. The first is a Pick a Box style bonus that is triggered by getting a Bonus Mouse symbol anywhere on reels 1, 3 and 5. Once activated you move to a second screen stage known as the Laboratory Bonus (Preview). Here you get to pick to items to transform the mouse into a range of creatures. The best win we saw from the Laboratory bonus was 35X bet so this seems to be the win to go for. You actually get three chances at the bonus as you can choose to try again if you're not happy with your win. Of course there is always the chance that the next win will be lower but this is often a risk worth taking especially if you get a low 2X to 10X bet win. There is one thing that looked a bit odds to us and that was the fact that it appears Dr Watts Up is rather flat. You will notice this when you're on the Laboratory Bonus and he turns around. It has no effect on the game play but in our opinion it detracts from the theme and just looks a bit strange. 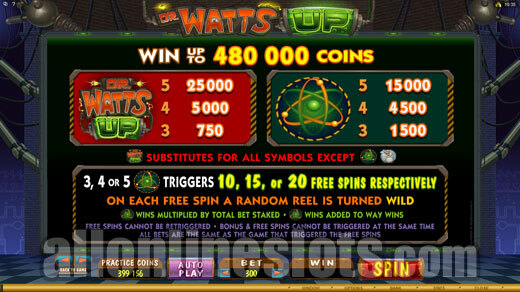 The second bonus on Dr Watts Up is a free spins feature that is triggered with the scattered Atom symbols. Getting three or more activates the feature with five paying a big 1,500 coins or 30,000 coins at max bet. Three, four of five scatters award 10, 15 or 20 free spins. There is no multiplier on the free games and the free spins cannot be re-triggered both of which are a bit of a negative. 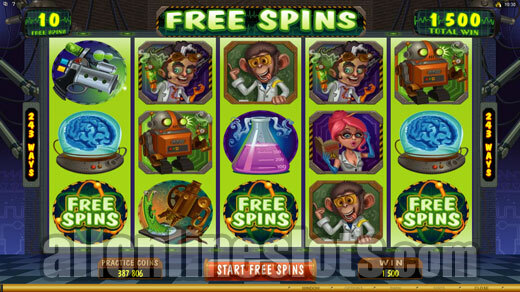 There is however a big advantage on the free spins in the form of a wild reel on every spin. At the start of each free game the ray gun moves along the top of the reels and selects one reel to turn wild. This wild real means that any five of a kind wins are paid at least three times in a single spin. Get a few regular wilds on the screen and you can win on a lot of different ways which can pay very well. The highest possible jackpot on the free games is a big 450,000 coins.